For those not familiar with the this tongue-twister named goaltender, Ukko-Pekka Luukkonen is an 18-year old from Espoo, Finland, taken 54th overall by the Buffalo Sabres in the 2nd round of the 2017 NHL Entry Draft. His 6’4″ stature and performance in recent years on the international stage in the World Junior Championships (WJC) has ushered him into prominence among scouts, leading to his early selection by the Sabres this year. But just what kind of goalie is Luukkonen, and what can we expect to see from him in the near future? 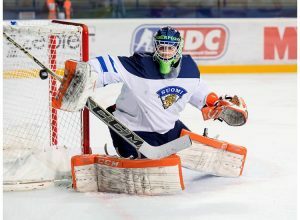 Ukko-Pekka Luukkonen has been playing up from his age level for several years, spending part of the 2015-2016 season with HPK U20 in the Jr. A SM-Liiga as a mere 17-year old, playing in 15 games, with an outstanding 1.98 GAA and .924 SV%. He appeared in 8 playoff games as well that year, posting a 1.94 GAA and .920 SV%. In the 2016 IIHF Under-18 World Championships, he led Finland to a gold medal, turning 17 only a month prior. In a full season with HPK U20 in 2016-17, Luukkonen played 35 games, again putting up incredible numbers with a 1.78 GAA and .917 SV%. In 9 playoff contests, he posted a 2.01 GAA and .915 SV%. 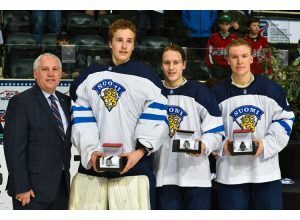 This past year with the WJC Finland U18 squad, Luukkonen was shaky, posting subpar numbers for himself with a 2.90 GAA and a rather poor .899 SV%. His performance was considered disappointing as he finished a silver medalist in a tournament he had dazzled in just a year earlier. Luukkonen has quite the resume for an 18-year old, especially for a goaltender. It is not a surprise that heading into this year’s Entry Draft, NHL Central Scouting had him pegged as the #1 European goaltender available for selection. Many even considered him the top goaltender available, period. As far as the style and ability of his play, look no further than his height; a 6’4” goaltender has the ability to cover the net and make saves in ways that other goalies cannot. Scouts have praised Luukkonen for his leg strength, saying his lateral mobility is one of the brightest spots in his game. His height and long legs allow him to be efficient in both stand-up and butterfly situations, as he is big enough to not have to worry about giving away the top of the net when he goes down. Even when sliding through the crease on his knees, Luukkonen’s shoulders touch the crossbar, making him solid at close-in play and angle-cutting from all areas of the ice. Like all goalies, though, there are areas of Luukkonen’s game that could be better. Scouts have reported that his puck handling and crease play is sloppy which could be one disadvantage of his lanky height, see how another tall goalie in Ben Bishop potentially opens holes when moving on his knees. Puck handling is something Luukkonen could work on, however, as well as crease play and keeping his wickets tight. He is athletic and excellent at puck-tracking, which gives him a starting point for crease work. Ukko-Pekka Luukkonen is a promising young prospect with a wealth of potential, and time still to develop into a complete goaltender in all facets of his game. He is under contract for next year with HPK in Liiga in Finland, and should make yet another appearance with Finland in the 2018 World Juniors this December, conveniently held in Buffalo, New York where the team that picked him can get a chance to watch him at home. 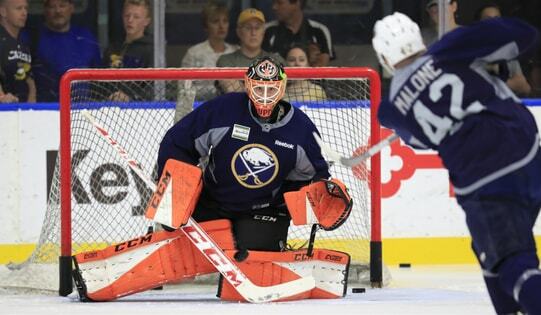 It will be interesting to see over the next few years how Luukkonen develops and what kind of goalie he can potentially be for the Buffalo Sabres in the years to come.